This is the best Australian Merlot I’ve had in some time. Importantly, this doesn’t taste anything like your average Aussie Merlot. Instead, it reads from a song sheet that is more like the Nero d’Avola that makes up 10% of the blend. A serenade of black fruited energy that is, well, deliciously different. If there is one thing that I do wonder about this wine it remains the influence of the amphorae it was fermented and matured in. That energy, that lively juiciness – could it be only enhanced by the quasi-mystical clay pots? Or am I just drinking the Kool-Aid? Whatever it is, this is tasty wine. 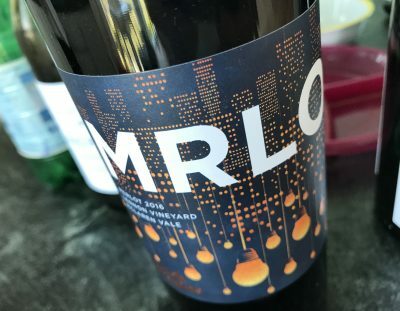 Sourced from Mclaren Vale’s Lennon Vineyard planted in 1994, this is fermented in both amphora and open, one-tonne fermenters, then spending 9 months in clay. A dark purple coloured wine, this has lots of dark, luscious, blackberry fruit. I’d almost pick it as having more Nero than a token splash as it’s just drenched in ripe, licoricey rich fruit, tending towards fruit cake, but not overripe. Just perfect. Beyond all this fruit lies a palate of fine, light tannins, and acidity that Brad Hickey calls ‘glossy’. Energetic, plump and very drinkable, it’s strictly speaking a wine of fruit and some critics may score it down as a result. But as a showcase of how joyful ripe grapes can be when squished and turned into wine, it’s perfect. Best drinking: 2017-2027. 18.5/20, 94/100. 13.9%, $37. Would I buy it? I’d buy a bottle off a list for sure.